This page lists CBC players who have represented the Melbourne Aces in the second iteration of the ABL. Chelt players from both the summer and winter sections of the club have represented the Aces. On the roster: Brad Harman, Ben Leslie and Lachlan Madden. On the roster: Travis Blackley, Blake Cunningham, Brad Harman and Ben Leslie. The second season of the ABL Melbourne Aces roster again featured a number of Cheltenham Summer and Winter Rustlers. Travis Blackley, Blake Cunningham, Hayden Dingle, Paul Rutgers and Paul Weichard. Rostered Winter Rustlers: Matt Blackmore, Adam Blackley and former Winter player Andrew Russell. 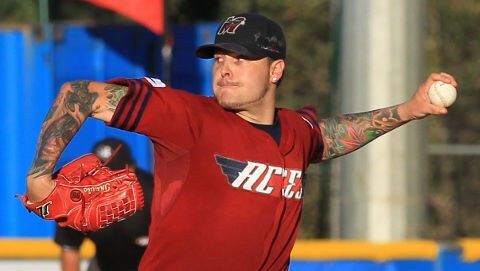 The 2011-12 season was a successful one for the Aces, making the ABL Championship series against the Perth Heat, going down 2-1 in a very close run final. Travis Blackley pitched game 1 of the ABLCS. In 2010, the ABL was finally relaunched with 6 teams: the Sydney Blue Sox, Adelaide Bite, Perth Heat, Canberra Cavalry, Brisbane Bandits and of course, the Melbourne Aces. It’s a mark of the club that Cheltenham was able to contribute a significant number of personnel to the inaugural Aces roster and all of them managed to secure playing time and to make contributions over the course of the season: they can also always say they were members of the club’s first year. 2010-11 Summer Rustlers on the Aces roster were Club Coach Hayden Dingle; outfielders Nathan Aron and Paul Rutgers; and pitchers Blake Cunningham and Kable Hogben. 2010 Winter Rustlers on the Aces roster were pitchers Adam Blackley and Matt Blackmore and outfielder Andrew Russell. Winter Club Coach Dave Clarkson was also on the Aces coaching panel. Then of course we have a ‘spiritual’ Rustler in Travis Blackley on the Aces roster who, though not playing with the club at that time, is always considered a Chelt person. And last but not last least, the 2010-11 Aces scorer was long time Cheltenham stalwart Michael Gourlay rounding out the club connection. The ABL existed as a National League in the 1980s-90s with Melbourne’s teams being the Melbourne (Waverley) Reds, Melbourne Monarchs and Melbourne Bushrangers.